In the background: the bell tower and the façade of the cathedral dedicated to the Assumption of the Blessed Virgin Mary. This cathedral was built after the fire of 1186 and the earthquake of 1448. 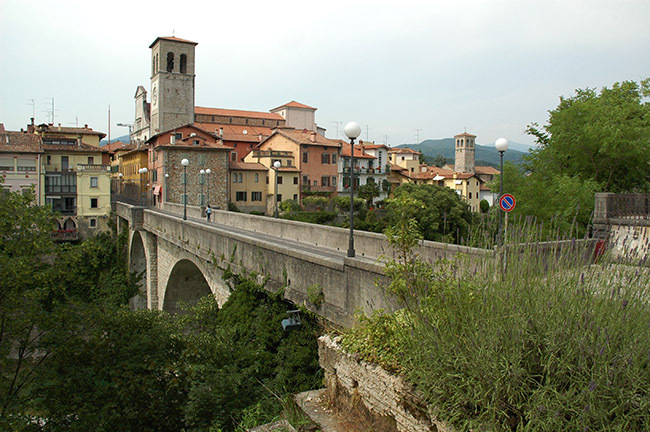 The architect responsible for its construction, Erardo from Villach, was also the designer of one of the symbols of Cividale: The Devil's Bridge (Ponte del Diavolo). Unfortunately Erardo died before finishing the Cathedral. Noteworthy is the silver altarpiece of Pellegrino II, a masterpiece of medieval jewellery. Equally noteworthy, despite requiring a little effort to locate it, is the stained glass window representing St. James the Greater and the pilgrim's symbols.